The former professor of the Ateneo de Manila University who is now living abroad wants to call the attention of the Supreme Court, Congress, Office of Ombudsman, CHR, Media, and Church to speak truth against President Rodrigo Duterte's vigilante killing? Prof. Christina Astorga wants to stop President Duterte's blitzkrieg vigilante killing which is unconstitutional, illegal, and immoral according to her. According to the professor, it was her new post because the old one was 'MYSTERIOUSLY DELETED' on her Facebook wall. Professor Astorga said, "My postings are being mysteriously deleted. My posting: "Calling SC, Congress, Office of Ombudsman, CHR, Media, and the Church. Why the silence? Why can you not speak truth to power?" has just been mysteriously deleted. But mysteriously might not be the correct word." "For we know who are in this kind of dubious operation! I will make another posting and see what they will do again!," the professor added. Prof. Astorga reposted this open letter yesterday evening, June 3, 2016. Then she urges her followers and friends to share her statements so many could read it. The former professor of AdMU was become viral online after her several controversial remarks against the new president of the Philippines. And here is the latest 'open letter' she created, "CALLING SC, CONGRESS, OFFICE OF OMBUDSMAN, CHR, MEDIA, CHURCH. WHERE ARE YOU? WHY THE SILENCE? WHY ARE YOU NOT SPEAKING TRUTH TO POWER?" "ARE WE AT THE DAWN OF ANOTHER MARTIAL LAW REGIME?" 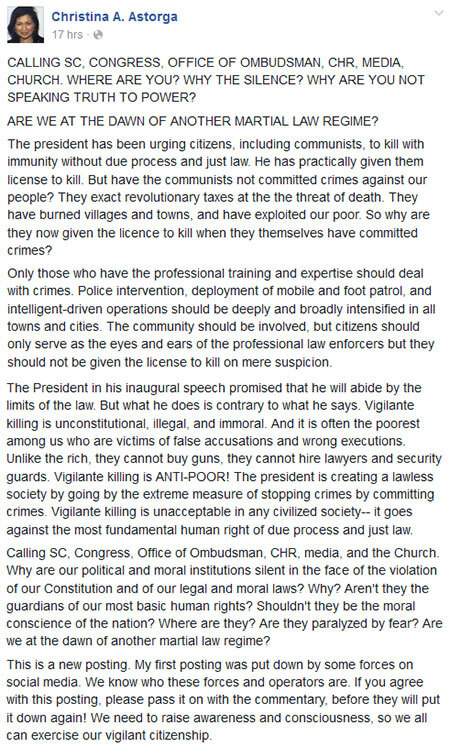 "The president has been urging citizens, including communists, to kill with immunity without due process and just law. He has practically given them license to kill. But have the communists not committed crimes against our people? They exact revolutionary taxes at the the threat of death. They have burned villages and towns, and have exploited our poor. So why are they now given the licence to kill when they themselves have committed crimes? " "Only those who have the professional training and expertise should deal with crimes. Police intervention, deployment of mobile and foot patrol, and intelligent-driven operations should be deeply and broadly intensified in all towns and cities. The community should be involved, but citizens should only serve as the eyes and ears of the professional law enforcers but they should not be given the license to kill on mere suspicion." "The President in his inaugural speech promised that he will abide by the limits of the law. But what he does is contrary to what he says. Vigilante killing is unconstitutional, illegal, and immoral. And it is often the poorest among us who are victims of false accusations and wrong executions. Unlike the rich, they cannot buy guns, they cannot hire lawyers and security guards. Vigilante killing is ANTI-POOR! The president is creating a lawless society by going by the extreme measure of stopping crimes by committing crimes. Vigilante killing is unacceptable in any civilized society-- it goes against the most fundamental human right of due process and just law." "Calling SC, Congress, Office of Ombudsman, CHR, media, and the Church. Why are our political and moral institutions silent in the face of the violation of our Constitution and of our legal and moral laws? Why? Aren't they the guardians of our most basic human rights? Shouldn't they be the moral conscience of the nation? Where are they? Are they paralyzed by fear? Are we at the dawn of another martial law regime?" "This is a new posting. My first posting was put down by some forces on social media. We know who these forces and operators are. If you agree with this posting, please pass it on with the commentary, before they will put it down again! We need to raise awareness and consciousness, so we all can exercise our vigilant citizenship." Do you agree with prof. Christina Astorga? Please took the comment box below and share your thoughts below. 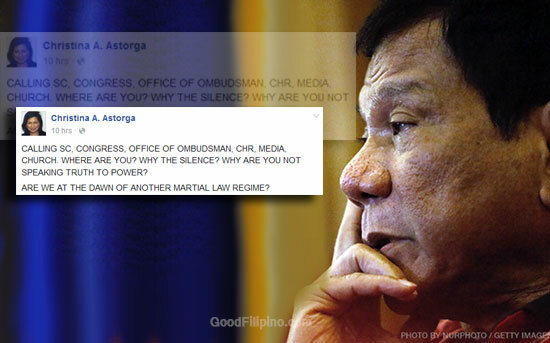 Comments or suggestions about "Prof. Astorga calling gov't agencies, media and church to speak truth against President Duterte " is important to us, you may share it by using the comment box below.